HUNTINGTON, W.Va.– Marshall University and the Marshall University Foundation Inc. celebrated the philanthropy of many of their most generous donors Friday evening (Oct. 28) with the first Recognition Celebration at the Marshall University Foundation Hall, home of the Erickson Alumni Center, on the Huntington campus. 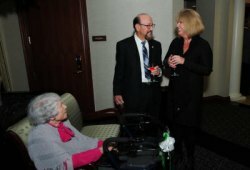 Approximately 125 people from throughout the country attended the event in which lifetime giving societies were announced, and plaques honoring the donors unveiled. Four plaques displaying the names of more than 250 donors have been hung on the walls of the foundation hall. es Huff, a Gilbert, W.Va., native currently living in Phoenix, Ariz., drove 1,983 miles to attend the celebration. “I got an invitation (from Kristi Arrowood, director of foundation development and strategic programs for the Marshall Foundation), and I thought it sounded good to me,” Huff said. The President’s Circle, which recognizes contributions or pledges of $100,000 or more. Tim Haymaker is a member of Marshall’s Pathway of Prominence and longtime MU supporter. He acknowledged the importance of Friday’s event.